City project as a result of the 500th birthday of the world-famous anatomist Andreas Vesalius. One of the most influential characters in the renaissance period and former student at the University of Leuven. An annual festival for media art where the most impressive installations from both Belgium and abroad are consolidated in a comprehensive exhibition. 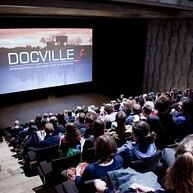 Enjoy a selection of the best national and international documentaries in various locations throughout the city. 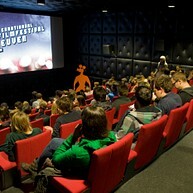 All films are in English or with English subtitles. Leuven opens all taps during three weekends. With beer tours, tastings and brewery visits, the city is more than ever 'the place to beer'. Leuven Innovation Beer Festival | 13+14.04.2019 A platform for innovative craft breweries. Food & Hops | 19+20.04.2019 Enjoy cheeses and dishes by Leuven’s best chefs, always paired with the tastiest (local) beers. Zythos Beer Festival | 27+28.04.2019 The largest beer tasting festival of its kind in Europe. You can also enjoy beer experiences & brewery visits. Food & Hops is a brand-new event at the crossroads of beer and gastronomy. You can sample dishes by Leuven’s best chefs and cheeses from Elsen and Van Tricht, which are always paired with the tastiest (local) beers. The Leuven Innovation Beer Festival is a platform for craft breweries from all over the world. 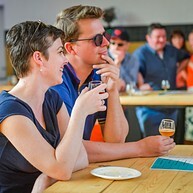 You can taste innovative beers and learn everything about the ingredients, the techniques used, the production, the energy used, the packaging or even the origin of the recipe. "A must for any beer aficionado", if we are to believe the international press and visitors. 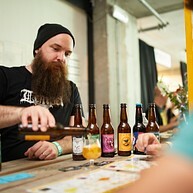 The Zythos Beer Festival is the largest beer tasting festival of its kind in Europe. 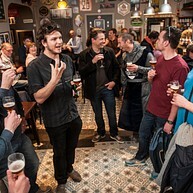 More than 100 Belgian brewers who produce 500 different types of beer, all in one location. Beer fans and aficionados travel from all corners of the planet to discover that Belgians really are the best brewers of beer in the world. A giant beer festival that you must not miss! At the festival, you can rent a tasting glass and jetons. You can exchange these jetons at the various beer stands for a 10 cl sample. and& is a one of a kind summit & festival at the intersection of health, tech & creativity, curated for the curious. Program: inspiring talks, avant-garde music acts, a start-up & scaleup forum, a tech expedition & art interventions in public space. A visit to Leuven is highly recommended, especially in summer, when there is an extensive offer of musical, culinary and other events within the scope of Het Groot Verlof (the summer program in Leuven). Unique summer festival in the atmospheric enclosed garden of M-Museum Leuven with concerts, comedy, performance, dance, spoken word and visual art. 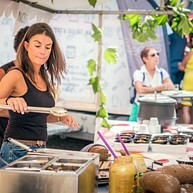 The centre of Leuven turns into an exclusive playground for bon vivants during this leading gastronomic event in Leuven. 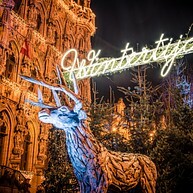 A range of winter activities at Winterseason in Leuven: the Leuven Christmas market, a nostalgic fair, an exclusive guided tour in the Leuven town hall or winter walks. 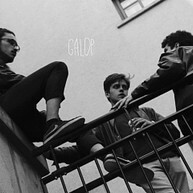 The best this year had to offer in the wonderful world of short film.